Heavy: this is where heavy maintenance including bogie work and unit overhauls are done. Testing tracks might also be in proximity for units to be either commissioned (first time use) or certified after an overhaul. In some cases a heavy maintenance depots will have mini foundries attached but they are not the same as full workshops where units are built or decommissioned. No matter which way one slices or dices this the heavy Depot location for the Northern Airport Line is sub-optimal. The grey is Airport zoning (and land ostensibly belonging to Auckland Airport) while the Cyan and Dark Cyan is Light Industry and Heavy Industry (yellow is Future Urban Zone). I can perfectly understand Patrick wanting the depot to be at Landing Drive where the Park and Rides are. However, given the land belongs to the Airport and PnR’s would be with us for a while I do not think the Airport (nor Air New Zealand for that matter) are going to give up the sites. Even if they did who ever owned and ran the depot (most likely NZTA) they would be paying premium land rents to AIAL (the Airport). It also occurred to me the Northern Runway might be slated for that area and if not extremely close by so the Airport might get prickly having a heavy depot in such an area. If we look some 2.3km to the right a solution presents itself and that is where Auckland Transport said the bus depot would go for the Southern Airport Line. The land is zoned Light Industry and the nearest residential area is over one kilometre away – so we won’t be lugged with reverse sensitivity issues unlike Stoddard Road and Wynyard Quarter. The land is also blank at the moment so the Depot is not having to exactly worry about demolition of existing buildings the other depots including Landing Drive would face. 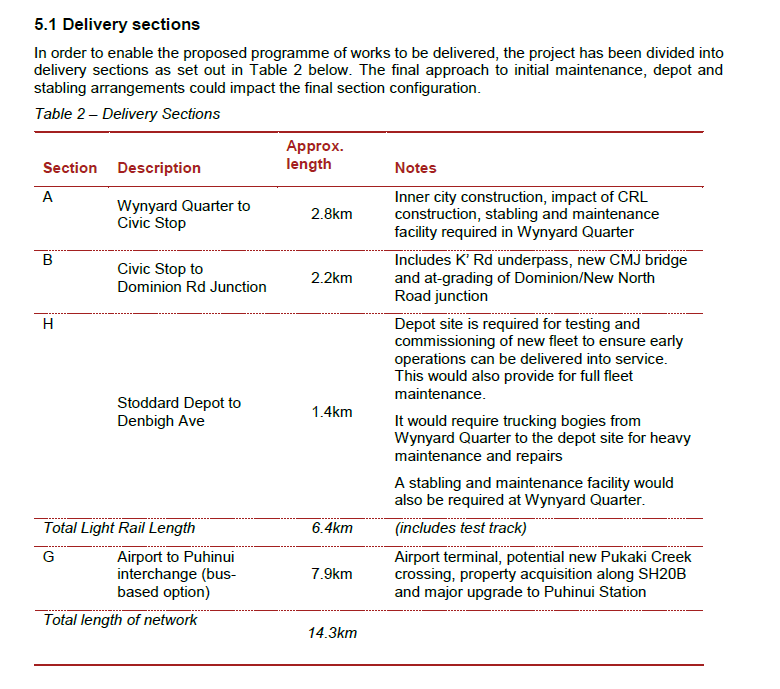 The depot sits right on SH20B which has direct access to the oversized truck route that uses SH20 and Wiri Station Road (to reach State Highway 1) – most of all those trucks would not be trundling through a residential area. Finally if a small foundry was to be attached to the heavy depot the emissions would not trigger reverse sensitivity issues due to and again residential areas not in close proximity. 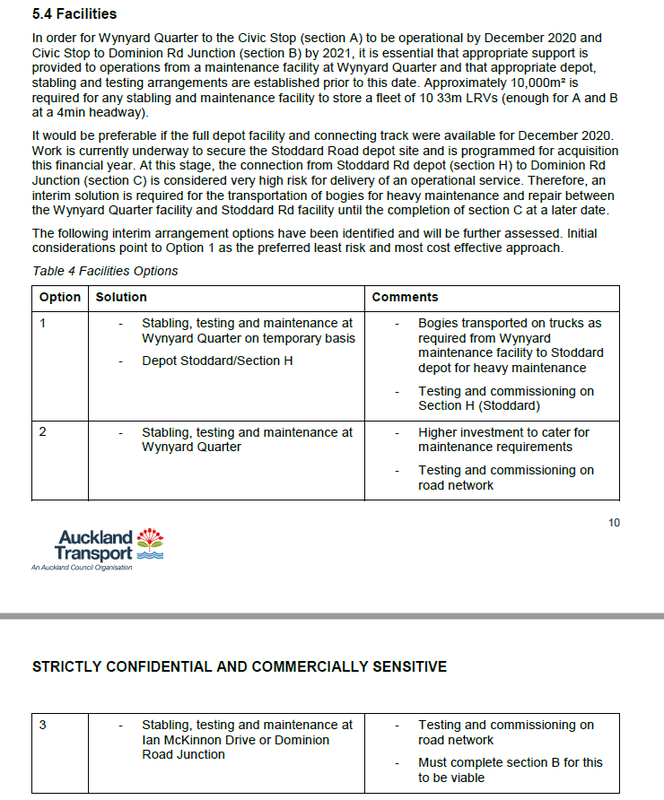 One other thing is that the SH20B location for the depot allows test tracks to be built (land is blank currently) without interference of the road network unlike Stoddard Road and even Landing Drive. This allows commissioning of the units without problems nor interference. The site would also not be constrained by land size when it came to stabling of the fleet. Why not extend the tracks all the way to Puhinui Station and Manukau City Centre seeming they have already started along SH20B? Wouldn’t the extra cost be very small to go that last 7km to reach Manukau? 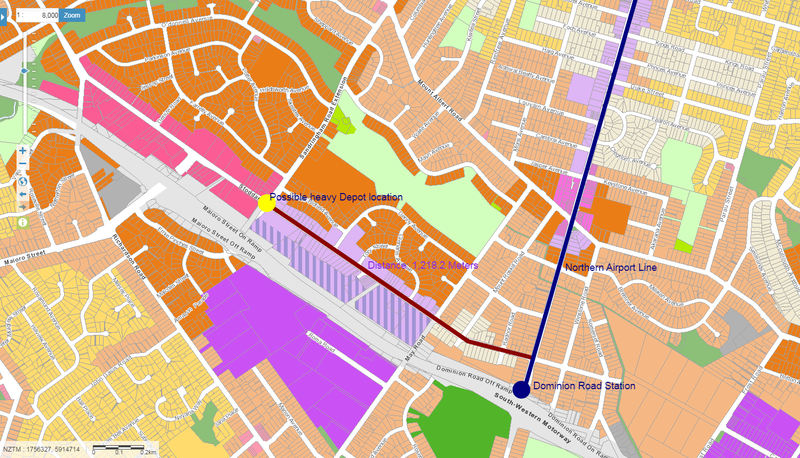 The answer is you would take the LRT line to Manukau as a natural conclusion given the depot placement. What do you think on locating the depot for the Light Rail trains . Agree with Don & Robert. It’s important not to dilly dally. Start with the Southern link, which seem’s to be the quickest achievable anyway. Workshops etc: Don’t know about ownership BUT there are large marshaling yards already at Westfield and Wiri (where the inland ports are)? May have the names wrong but I’m sure you know where I mean. They’re already ‘plugged’ into Heavy, couldn’t be too hard to include workshops could it? From memory, Mays Rd Onehunga was the depot/service place for trams back in the day. Plus the one at Stoddard Rd. I agree that the CBD thinking is detrimental to a speedy resolution. The major traffic flows indicate to me that South Auckland provides most of the Airport labour……. In a sensible world, we’d make the light rail gauge the same as our heavy rail and provide an intersection point or two. We’d also ensure that the electrical systems were compatible. Then light rail vehicles could be serviced using the present suburban rail fleet facilities. If it was impossible to make the electrical systems compatible, light rail vehicles could be towed. Such compatibility might allow light rail vehicles to run on heavy rails for passenger transport if necessary, although I imagine heavy rail trains couldn’t run on light rail tracks because of weight issues. I would imagine there would be major safety issue with running 25Kv down suburban street, but I’d agree using the same gauge (1067mm/3’6””) would make a lot of sense and would allow the EMU maintenance depot to be used to service the LR vehicles without having to make a major investment in duplicating a service depot for the LR vehicles. 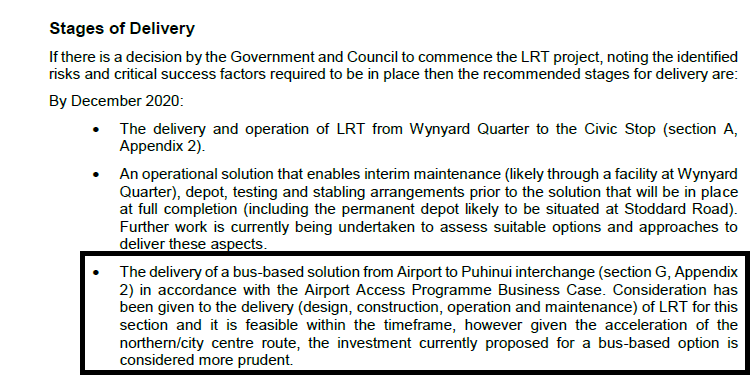 I’ve got to agree if we aren’t going to build Heavy Rail to the airport then the it make a lot of sense to build the Southern Light Rail line from the airport to Puhinui and onward to Manukau and Botany first then, or even at the same time, build the Northern line from the airport to Onehunga and then onward to the CBD. 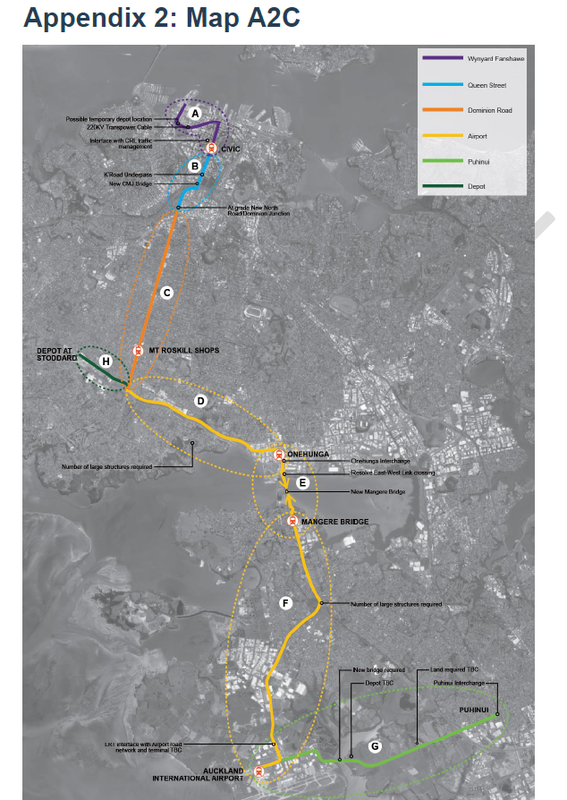 This gives a great rapid rail connection between the airport and the CBD and all points southe of Auckland. If we must have a “show case” line for 2020 then by all means build the Wynyard to Civic section, but if it’s true commuter servicing we are aiming for then Connection Mangere and the airport area to the Southern/Eastern lines and to the Onehunga lines has to make far more sense. Agree there entirely – and am pushing this with Twyford as hard as I can.